How famous is writer Edgar Allan Poe, the author of the chilling The Raven poem, dozens of memorable short stories, such as “The Black Cat,” and the inventor of detective fiction? Chris Semtner, curator of the Edgar Allan Poe Museum in Richmond, Virginia, shrugged his shoulders. “We get people from Russia and Europe here who do not know who Thomas Jefferson was but know everything about Poe,” he said, a big smile on his face. The Russians, the Europeans, and some 900 Americans, are expected next Saturday, January 20, when the downtown museum hosts its annual Poe birthday jubilee. He would have been 209 years old. Poe is one of the world’s most celebrated writers. He is the author of stories such as The Murders in the Rue Morgue, The Masque of the Red Death, The Mystery of Marie Roget, The Tell-Tale Heart, The Gold Bug, The Premature Burial, The Fall of the House of Usher, the Purloined Letter and The Pit and the Pendulum. Six of his stories, including The Tell-Tale Heart and The Fall of the House of Usher, have been turned into movies. Some of his most popular poems are Annabel Lee, Lenore and Tamerlane. His most famous work, of course, is the eerie poem The Raven. The writer, born in Boston, lived much of his life in Richmond. He also took up residences in Baltimore, Philadelphia and New York. The annual Richmond birthday blast, a regular fixture since 2002, is the largest of many scheduled across the world next week. Many of the guests arrive in Richmond with huge tattoos of Poe’s face on their arms, chests and backs. Reports are that a lot of people with tell-tale hearts, a flock of ravens and all of the descendants of the Usher family will be there for the champagne and wine and music concerts. The party is held in the four small buildings of the Poe museum at 1914 E. Main Street (804-648-5523) complex and the “enchanted garden” which they border. A large tent is set up and guests are regaled by bands, singers, actors staging scenes from Poe stories and, of course, lots of poets. The day will start at noon with a 90-minute concert by The Folly Band. They will be followed at by writer Rachel Pater at 2 p.m. conducting a Richmond story discussion. The narrator of Poe’s story ‘The Tell-Tale Heart’ will be given a mock trial at 2:30. Writer Noreen Lace will read from her book Eddy, about Poe, at 3:30 p.m. At 4 and 6 a Poe impersonator will meet the visitors and talk about the author. The band The League of Space Pirates will perform from 7 – 8:30 p.m. and a walking tour of Richmond, based no Poe’s last night in the city, will be staged at 9 p.m. At the stroke of midnight, all gathered at the museum will offer a toast to Poe in the garden. “People come for an hour, two or three. Many people stay all day. They get to watch the events of the day, but they mingle with each other, too. Some of them go to parties in other cities. Many come here from distant states and make a vacation out of their visit,” said Debbie Philipps, program director for the museum. What made Poe such a noted writer in his day, and now? It was not just his massive and impressive literary work, says museum curator Semtner. “Certainly, he accomplished a lot. Poe invented the psychological thriller and the detective story. He was a really gifted poet. He was a fine short story writer and helped to make it part of literature. Many movies had been made from his stories. I think, though, that it was his strange persona that made him so famous. He was the bad boy of American literature, the James Dean of the writing colony. He had a rebel attitude, a wild side. Poe was different, an original. He felt that he had to fight his way through life, and a lot of people feel that same way. He inspires them,” Semtner said. The Poe Museum, which draws 30,000 visitors a year, is charming. None of its buildings were homes of Poe (he lived nearby), but all of them have pieces of places where Poe lived within them, such as his boyhood bed, stairs he raced down as a kid from another house, some of his clothes and his wooden writing desk. There is a monument to Poe that used to be in the Metropolitan Museum of Art in New York. It is in the same room with a statue that is a replica of one that sits in the Virginia state house. The museum constantly gets new pieces of Poe memorabilia. Recently, a man came in with a drinking glass that belonged to Poe’s foster parents when he lived with them. Another man brought in an original Poe portrait after he saw a replica on television. Walking through the museum, even the greatest Poe fan discovers something they did not know, such as the existence for years of ‘The Raven Society’ at the University of Virginia, where Poe went to school for a short time, or that his sister Rosalie played the piano (it is in one of the rooms). The museum is full of pieces tied to marvelous stories, such as Poe’s trunk. The writer left it at a hotel in Richmond and then traveled to Baltimore, where he died. The trunk was not discovered until years later. It had been left there because Poe, destitute, could not pay his hotel bill and left the trunk, and the clothes in it, to pay it. Two of his relatives engaged in a bitter battle, in private and in court, for the trunk, that was just worth a few dollars, but handed all of his manuscripts to a literary agent for nothing. The best thing about the Poe museum is that it is as spooky as Poe’s stories and characters. It has foreboding stone walls, low ceilings and wooden floors that creak when you walk on them. The doorways are small and the lighting a little dark. The trees around it bristle ominously when a strong wind comes up. If you listen closely, you can almost hear the raven squawk. Poe loved cats and wrote some stories with his cat Catterina seated on his shoulder. Two black cats, Pluto and Edgar, live at the Museum now and crawl about the complex, adding a bit of a chill to the day. Poe started his writing career by contributing short stories to newspapers, such as the Southern Literary Messenger (one if its couches is in the museum). He later worked for several newspapers in New York and Philadelphia. He was the master of taking newspaper stories, such as cats accidentally buried in the walls of houses, and turning them into horror fiction. He understood the value of horror, too, telling one newspaper editor while the editor may have thought Poe’s story rather gross, the writer knew that gross stories sold papers. Poe’s father deserted him and his mother died when he was quite young. He was brought up by wealthy foster parents, John and Frances Allan, who lived in Richmond. Unhappy there, and disowned by his father after a series of arguments over his gambling debts, he signed up for the U.S. army and later spent a year at West Point. He published his first book when he was 18 and plunged into a writing career. On the personal side, he gambled and drank and led a boisterous life, that included marrying his cousin, Virginia Clemm, who was just 13, when he was 24. In addition to becoming a noted writer, Poe also gained fame as a book critic and was the talk of the town for his rather harsh reviews of many works. His caustic reviews made him numerous enemies, too. He once wrote a sharp critique of a book editor whose volume included Poe’s own work. He feuded with editors and other writers, falling into a heated dispute with the famous Henry Wadsworth Longfellow, whom he was said to envy because Longfellow was a professor at Harvard and Poe had to live on the small wages he earned as a writer with no other source of income (the most cash he ever earned at one time was $100 for a short story prize). The popularity of the author of “The Raven” has spanned numerous generations and he has influenced writers and film maker worldwide. “It’s because I liked Edgar Allan Poe stories so much that I began to make suspense films,” said Alfred Hitchcock. 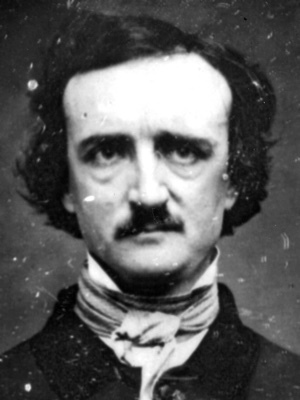 Will there ever be another thriller-chiller writer like Poe?